Florida Expo Park invites you to stage your next event in the heart of Tampa Bay. Accessibility is one of the many benefits Florida Expo Park has to offer. Our 325-acre complex is conveniently located off interstate highways close to some of Florida's most popular attractions, beaches, state parks, historic locations, downtown Tampa, shopping malls, numerous hotels and restaurants. 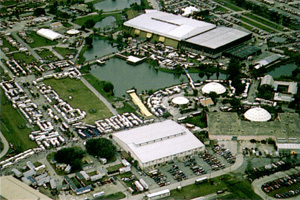 Florida Expo Park, Home of the Florida State Fair, is a versatile, multi-use complex designed to accommodate any size event and parking for up to 20,000 vehicles. Each building on the grounds features its own unique specifications and is equipped for disability access. Florida Expo Park management and staff offers customized service to ensure the most successful event. On-sight ticket offices, catering, staging contractors, a full service sign shop, and 24-hour security are available at your service. If it's a home show, boat show, convention, tradeshow, festival, spectator event, concert, RV show, equestrian event or livestock show you're planning, you'll be in good company at Florida Expo Park. Events such as the RV Super Show, Volvo International World Cup, NHL Tampa Bay Lightning, Ringling Brothers and Barnum & Bailey Circus, Disney on Ice, Canadian Snowbird Convention, and Metallica Tour have found Florida Expo Park and ideal location. Total flexibility and versatile accommodations allows Florida Expo Park to meet the needs of any event, large or small.